Today, we live in a very disenchanted world. Our built environment is purely functional and utilitarian, save for some merely aesthetic flourishes. Nature is similarly useful and at times pretty, but hardly anything more. We view our cultural and ancestral heritage as something more or less incidental to who we really are, and similarly devoid of any higher meaning. Our lives are so bereft of a spiritual element that we find it hard to even take seriously those religions that offer us salvation from our plight in this world and entry into an otherworldly situation full of the numinous meaning that our lives here and now lack. How, we tend to think, could such meaning really exist anywhere? The glints of enchantment that we can find amongst our lives are small, pale, and cold, because they don’t transcend the horizon of the mundane world within which we find ourselves. There is nothing spiritual or religious about them; they are incapable of reaching our ultimate concern. The Vikings and other Germanic peoples, however, lived in a radically different kind of world, one infused with divine presence and strong, sacred meaning. This enchantment encompassed the mainstays of “the way things are,” where nature and (Germanic) culture were seen as one seamless whole rather than a pair of opposites. The Germanic peoples were not “nature worshipers” – a modern misunderstanding of ancient paganism. Rather than isolating an abstract “nature” from “culture” and then worshiping “nature” as such, the Germanic peoples believed and experienced the gateway to the divine to be what we could perhaps call “Germanic culture-nature” – one unitary thing. 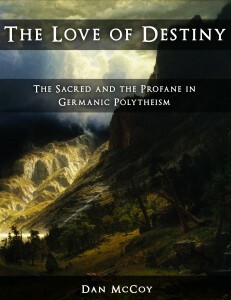 The Germanic pagans accepted the world on the terms on which they found it, working with the proverbial “way of the world.” This can be contrasted with the Christianity to which the Germanic peoples were introduced over the course of the Viking Age and Middle Ages, which tried to radically transform the world in accordance with an airy moral vision (which included the transformation of people’s doctrinal beliefs). The word “romantic,” in this context, points to the experience of the infinite in the finite, as it is given in nature and history. The word “conservative” in connection with romantic emphasizes the experience of the presence of the ultimate in the existing forms of nature and history. If a man sees the holy in the flower as it grows, in the animal as it moves, in man as he represents a unique individuality, in a special nation, a special culture, a special social system, he is romantic-conservative. For him the given is holy and is the content of his ultimate concern. The Vikings and other pagan Germanic peoples had more or less nothing that was “progressive-utopian” in their religion. Perhaps somewhat counterintuitively for modern sensibilities, the Germanic pagans’ sense of deep enchantment in the world went hand-in-hand with their being hard-headed pragmatists, not starry-eyed idealists. That is, they sought to advance their interests within the world as they found it rather than to fundamentally alter its character – to “save the world,” as we might put it today. There were no pagan Germanic “revolutionaries” of the sort we find in modern political movements. We can imagine that they would have reacted with mocking laughter to notions of “social justice” and the like. After all, the ancient Germanic peoples believed that the unfolding of events was directed by a blind, implacable fate. In their worldview, you ultimately couldn’t decide what happened to you; all you could do was react to your lot with honor and greatness or dishonor and smallness. In such a perspective, there’s not really any room for “saving the world” – only for doing the best you can in the midst of it. Let’s now look at some concrete examples of the enchanted Germanic world. The Old Norse word for “god” literally meant something like “pillar” or “vital force,” which suggests that the gods were thought of as the “pillars” that held the cosmos together. And that’s exactly how we find them portrayed in the myths. They didn’t live entirely apart from the world and only intervene in it from the outside; they were also immanent within it, or at least certain parts of it. For example, Thor, whose very name meant “Thunder,” was not so much the “god of thunder” as he was the god thunder – the divinity whose presence the Vikings felt in the thunder. His wife, the goddess Sif, was known for her long, luscious, golden hair that seems to have symbolized fields of ripe grain. Sif would therefore have been the goddess grain, and the storms fertilizing the vegetation would have been practically a ritual enactment of the consummation of the marriage of Thor and Sif. Much the same can be said of the god Forseti, the divine counterpart to the human “lawspeaker,” the head of the Norse legal assembly and judge of disputes. Just as Thor was the god thunder and Sif the goddess grain, Forseti would have been the god law – the god made manifest in the law and in the pronouncements of the lawspeaker. And so on for the other Germanic deities. 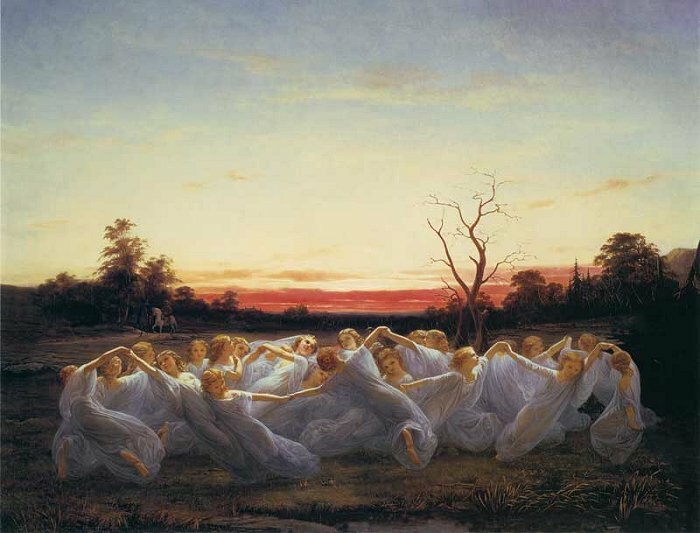 The enchanted Germanic world wasn’t only inhabited by gods, but also by lesser numinous beings such as land spirits, elves, dwarves, and giants. Any field, mountain, moor, forest, sea, stone, house, hall, person, custom, or event could potentially hold and transmit an intimation of some kind of divine presence. Magic was a seamless part of life, and the Germanic peoples frequently had experiences whose character and outcomes they attributed to magic. Furthermore, phenomena that we today would consider to be purely earthly could still be infused with divine power even if they weren’t inhabited by a god, a land spirit, or the like. Perhaps the most striking instance of this is the concept of heil (Old Norse heill, pronounced roughly like the modern English word “hail”). The continental Germanic word heil, from which our words “holy” and “holiness” come, originally referred to the religious status from which earthly well-being and success were thought to emanate. For example, a ruler’s heil was what made his reign prosperous, and if he failed in battle or in domestic affairs, it was due to a flaw in his heil. Up until the Reformation, Counter-Reformation, Witch Trials, and Scientific Revolution, most Europeans still lived in a highly enchanted world. But that was because their Christianity was a syncretic religion that still included many prominent pagan elements. Their religion was a paganized Christianity or Christianized paganism. God was the great bringer of prosperity in this world much more than he was the giver of salvation from it. The fields, forests, rivers, and mountains were still populated by elves, fairies, and other mysterious spirits. Individual desires and tribal loyalties were more important than abstract, universal ethics. (Compare medieval feudalism with the proto-communism of the earliest Christian churches.) And even inasmuch as people fought and died for Christianity, such as in the Crusades, it was for this European “folk Christianity” that was inextricably tied to quintessentially worldly concerns and identities. It took the traumatic religious, cultural, and intellectual revolutions of the sixteenth and seventeenth centuries to break them of that. Almost as soon as Europe began the process of “de-paganizing” itself in earnest – with the intention of purifying its Christianity – Christianity itself began to give way to scientific materialism. Its attempt to strip nature and culture of any spiritual import, and to reduce them to purely profane phenomena, set the stage for the “mechanical philosophy” that has sought to explain the world purely in terms of physical properties that can be understood through the methods of science and history. That project has now been carried so far that to explain any phenomenon in terms that aren’t purely physical seems whimsical and absurd. Spiritual or religious perspectives of any sort accordingly seem arbitrary and vacuous to many, and perhaps most, people. Christianity itself now hardly survives at all except in a secularized version of its ethical system. In a textbook example of “throwing the baby out with the bathwater,” the manner in which Christianity triumphed over paganism seems to have set the stage for its own demise, which followed swiftly. Russell, James C. 1994. The Germanization of Early Medieval Christianity: A Sociohistorical Approach to Religious Transformation. Tillich, Paul. 1957. Dynamics of Faith. p. 73. 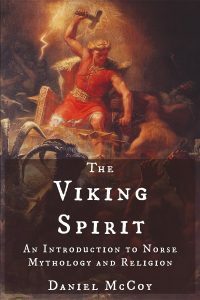 See Chapter Five of my book The Viking Spirit for a thorough discussion of the Norse conception of fate. Eliade, Mircea. 1959. The Sacred and the Profane: The Nature of Religion. Translated by Willard R. Trask. p. 145-146. Orel, Vladimir. 2003. A Handbook of Germanic Etymology. p. 151. Russell, James C. 1994. The Germanization of Early Medieval Christianity: A Sociohistorical Approach to Religious Transformation. p. 205. Erickson, Carolly. 1976. The Medieval Vision: Essays in History and Perception.